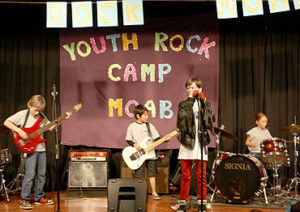 Youth Rock Camp Moab is 4 days of instrument instruction, band practice, song-writing, team and confidence building activities, and rock and roll fun for youth ages 8-17. Held over Grand County schools’ spring break, YRCM offers local youth an opportunity to explore self-expression and creative outlets through music. Students are also given opportunities for mentorship with local musicians and artists. A variety of positions are available for volunteers. Email youthrockcampmoab@gmail.com to receive a list of volunteer needs. Youth Rock Camp then conducts a short interview to determine the best placement for you. If offered a position with direct and independent contact with youth, a background check will be issued.